Electronic Arts is hoping to head off a lawsuit over Battlefield 3 by claiming a First Amendment right to use real-world military aircraft in the game. 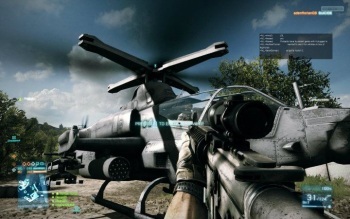 Battlefield 3 is based on an entirely fictitious conflict but it does feature numerous real-world elements, including three aircraft that may be familiar to military aficionados: the Bell AH-1Z Viper attack helicopter, the Bell UH-1Y Venom [Super Huey] helicopter and the V-22 Osprey transport aircraft. That's apparently a bit of a problem for Textron, the parent company of Bell Helicopter, which until recently was in discussions with EA over the unlicensed use of the aircraft in Battlefield 3. When those talks broke down, EA filed a motion in the federal court for the Northern District of California seeking a ruling that it has a First Amendment right to use real-life military helicopters in videogames without the manufacturer's permission. The move is intended to head off the lawsuit that EA apparently sees as inevitable. "The parties have been unable to resolve their dispute," it said in its filing. "EA therefore has a reasonable and strong apprehension that it will soon face a trademark and/or trade dress action from Textron." EA claims that the use of the aircraft is "protected by the First Amendment and the doctrine of nominative fair use" and points out that the packaging specifically states that the presence of real-world hardware does not constitute an official endorsement by the manufacturer. "Bell manufactured helicopters are not highlighted or given greater prominence than any of the other vehicles within the game," the company said. "The Bell-manufactured helicopters depicted in Battlefield 3 are just a few of countless creative visual, audio, plot and programming elements that make up EA's expressive work, a first-person military combat simulation." EA's case is bolstered by the recent Supreme Court ruling that videogames are entitled to the same First Amendment protections as movies, music and books, as well as a September ruling in a similar matter regarding the use of real-world player likenesses in its NCAA Football games.